One piece and everything is taken care of when that piece is The North Face Versitas Dual Short. It's made from material infused with FlashDry-XD™, so you know it will be extremely breathable and quick drying but still durable enough for even your most adventurous pursuits. The engineered fit allows for a full range of motion, and strategically placed mesh panels allow for maximum ventilation. But what makes this short a two-for-one is the included boxer brief liner, infused with the same FlashDry-XD™ technology to make sure you get full advantage of that powerfully breathable material. 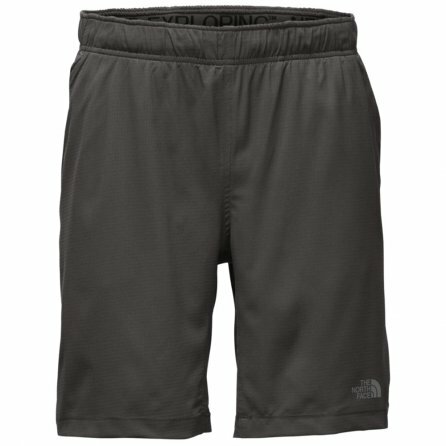 This is my second pair of TNF Versitas Dual Shorts. It is difficult to tell from the online photos, but these shorts have a built-in compression shorts liner. I bought my first pair of these shorts specifically for doing laying TRX type physical therapy exercises where you are partly inverted. However, after wearing them more, I have found that the liner helps prevent them from riding up or down as well. Fabric is thin, breathable, and dries quickly. All-around a great product. These shirts fit great and are true to size. Best worn at the gym or for casual wear. I purchased the Versitas dual shorts specifically for training. I the inner liner is perfect for stretching or performing inverted exercises such as the TRX. They also pack well and dry fast which is a plus. My picky 14 year-old son approved which says a lot! The inside has compression-like webbing which was unexpected but it fits well and fits true to size. Really like these. Hope to have them for a long time. I'm a runner and they are great for it. Great workout shorts for cross training or yoga. Very comfortable.